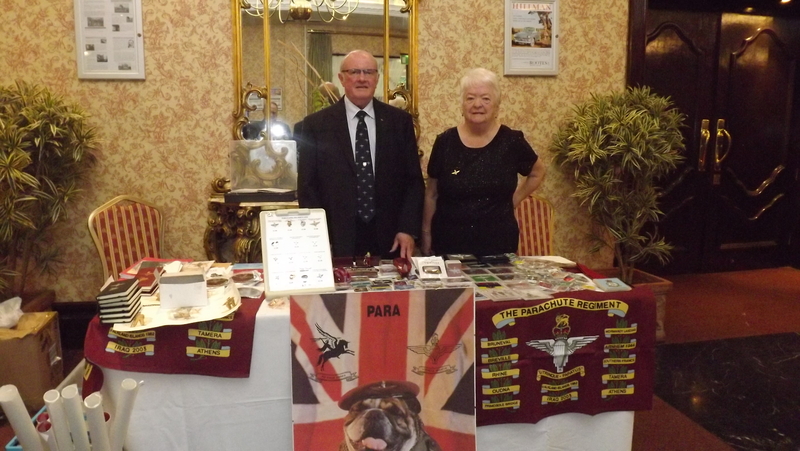 On Friday 10th of October 2014 members of the Midland Region of The Parachute Regimental Association, along with members of the 1st Airborne Logistical Regiment attended the annual weekend and gala dinner, at the Britannia Royal Court Hotel, at Keresley, near Coventry. Members relaxed during the Friday evening, and were entertained by an Elvis Presley artist during the evening. The following day members were free to do their own thing during the Saturday morning and afternoon. Nottingham Branch members spent some of this time visiting Coventry on the Saturday morning. On our return back to the hotel we set up our merchandise table and were able to raise £298 during the following three hours. From this we were able to donate £250 to the Midlands Region of the Parachute Regimental Association. Saturday evenings gala event was held in the main hall with dinner and entertainment, and included special guests and speaker. The weekend finished after breakfast on the Sunday morning. A great weekend was had by all who attended. We look forward to next years event, and thank the Regional Secretary, John Carey for putting in all the hard work to make this a great weekend. Above: John and Anne Needham in the hotel lounge with our merchandise stand.